Deadly Day In Pakistan: Dozens Killed In Multiple Blasts In Quetta : The Two-Way Back-to-back bomb blasts at a snooker club in the city killed at least 80 people. A Sunni extremist group claimed responsibility for the attack on the predominantly Shiite area. Earlier in the day, a blast at a city market killed 11. A separatist group said it was behind the explosion. Pakistani police officers and residents gather at the site of a bomb blast that targeted paramilitary soldiers in a commercial area in the city of Quetta, killing 11 people. Later in the day, twin blasts at a snooker club in the city killed at least 80 people. Back-to-back bomb blasts in the Pakistani city of Quetta on Thursday have claimed the lives of at least 80 people. "The death toll has risen to 81 so far," Mir Zubair Mehmood, a senior police official, said at a news conference. He said 121 people were wounded. His comments were reported by the privately owned Geo TV. Hamid Shakil, the deputy inspector general of police for the city, told the news channel that a suicide bomber blew himself up inside a snooker club. Ten minutes later, there was a second explosion, he said, that claimed the lives of people who had rushed in after the first blast. The dead include police personnel, journalists and rescue workers, Geo TV reported. The BBC reports that the area is predominantly Shiite Muslim; Lashkar-e-Jhangvi, a Sunni extremist group, claimed responsibility. A spokesman for the group said the second explosion was caused by a car bomb. 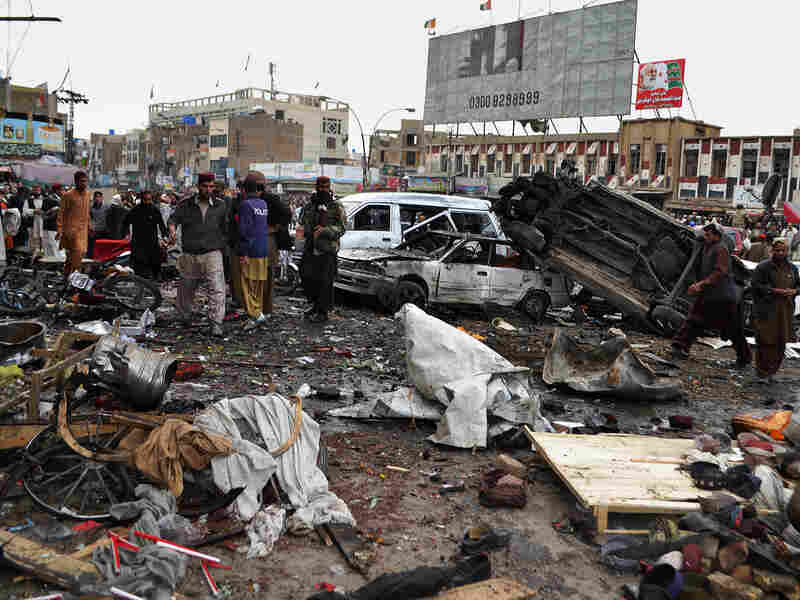 The twin blasts followed an explosion in a market area of Quetta, the capital of Baluchistan, earlier in the day. Eleven people were killed in that blast; 27 were wounded. The Associated Press reported that the United Baluch Army, a separatist group, claimed responsibility. Balochistan is plagued by both a separatist rebellion and sectarian infighting between Sunnis and Shias. The Taliban and armed groups that support them also carry out attacks in the province, particularly in areas near the Afghan border. Pakistan's military has been engaged in a long-running battle against those militant groups.